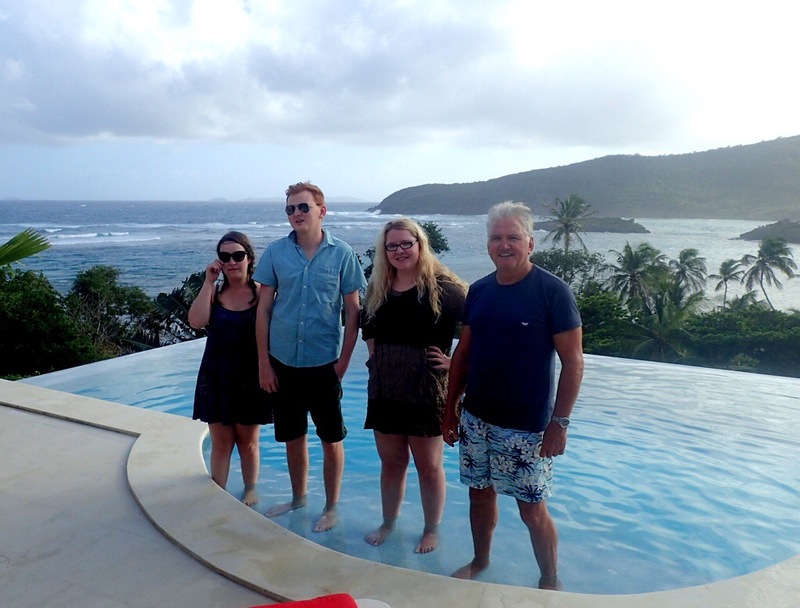 Early on Christmas Eve we left Bequia with a succession of squalls battering us. The squalls first appear on the horizon as forbidding dark clouds and as they carry high winds and torrential rain when spotted we leap into action, reefing the sails, clearing the decks and then if possible hiding below. The rain reduces visibility to almost nothing and the winds rattle through the rigging. The high winds, in or out of the squalls are common at this time of year, locally called the Christmas Winds, we have been trying to concentrate on the Christmas rather than the Winds. Alas, the winds and squalls have continued, at times it’s a bit like we are holidaying in Devon, all huddled below reading, writing or playing scrabble. Of course it is still hot and when the sun comes out to play our surroundings are magnificent. We arrived in the Tobago Cays at midday and Christmas really started when Rachael produced, Mary Poppins like, a five foot tree from her bag, Matt and Robyn brought baubles, Rick and I provided some fairy lights, which Matt strung around the cockpit and we played Chrismas songs on the stereo. The boat was transformed within minutes. Christmas Day started as normal with scrabbled eggs and smoked salmon for breakfast, followed by present opening, at eleven our neighbors came over for a glass of champagne, we ate a large lunch and took a little exercise. 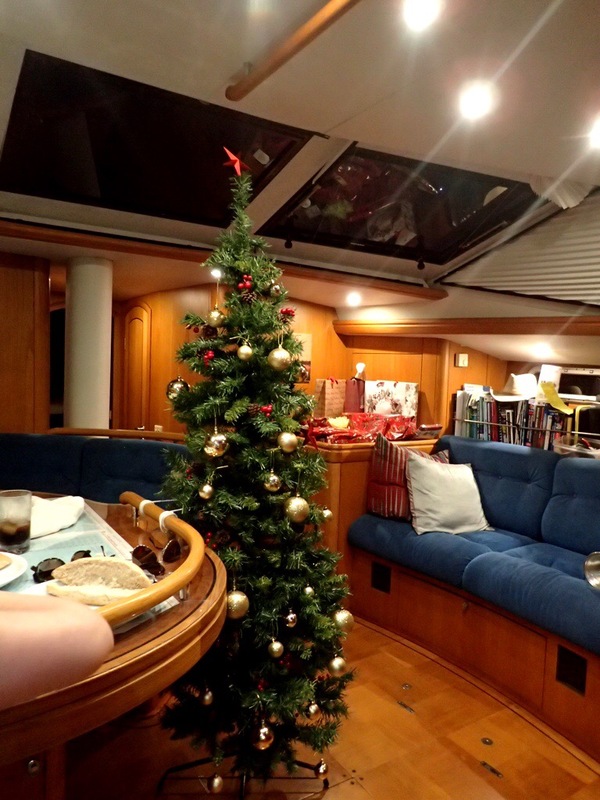 However, it was very much a Chrismas with a difference, our few presents were constricted by luggage restrictions, the neighbours came over by dingy from their Oyster yachts and the champagne was the bottle we had won from the ARC. 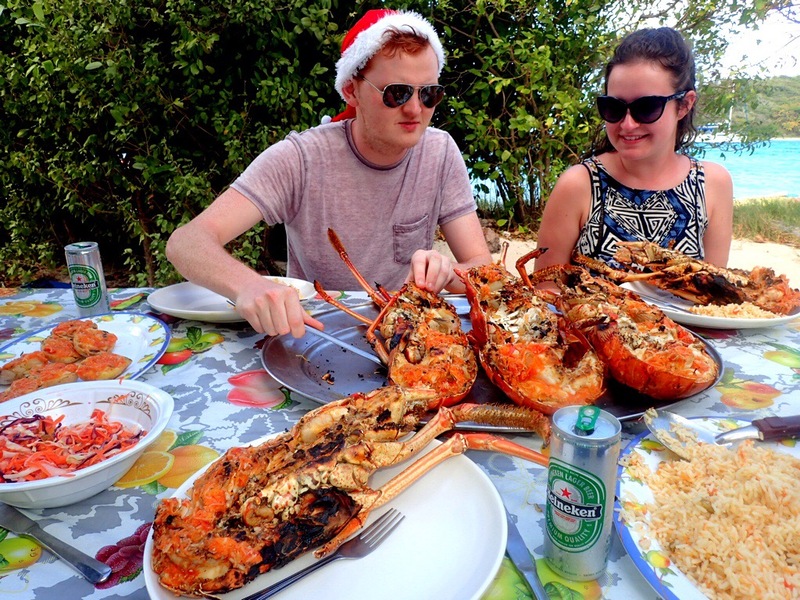 The excercise consisted of snorkelling with turtles and strolling with iguanas and our lunch was of huge BBQ lobsters that we ate at the beach. When the sun comes out the Tobago Cays are a mass of amazing colours, the small islands, as we have witnessed, get plenty of rain and are a rich green, the coral reefs from above the water are a pale brown and the sea a kaleidoscope of turquoise and blues. 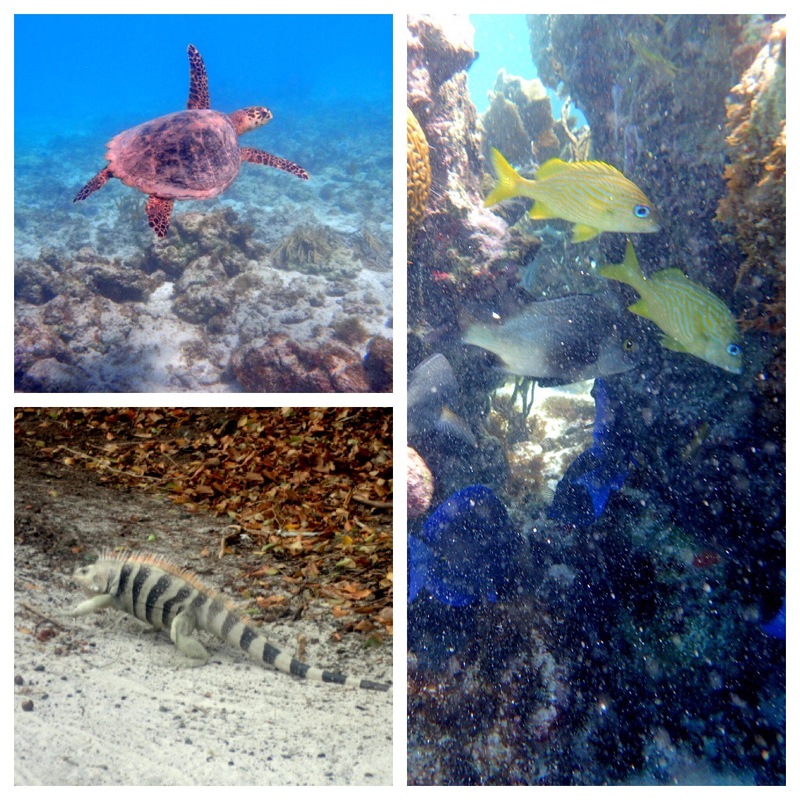 The area is a national park and the snorkelling although challenging in these windy conditions rewarded us with lots of fish and much to our delight a turtle. The islands are uninhabited by humans but home to large, 3ft nose to tail, iguanas, which, use to the tourists stroll past you nonchalantly. It was difficult to feel too Christmassy with the sun beating down and sand between our toes, we pinch ourselves to realise not just that we are here but that we sailed here, all the way from Southampton. We are anchored off the small Island of Bequia in the Grenadines, half way accross the world but we are continually bumping in to people we know. Half the crews of the ARC seem to be here and in a villa on the other side of the island are our old friends Laurie and Ian enjoying a Christmas break with friends and family. Talk about a room with a view, their villa, perched high in the hills, looks out to the Atlantic Ocean. We joined them for the evening yesterday, not only did they serve us a fantastic fish curry, they gave us a few hours on firm ground to relax. The high winds came as forecast and Monday night there was pandemonium as gale force gusts screamed across the bay. Anchors and even moorings were dragging, we spent all night watching out for problems, our anchor held firm but the catamaran in front of us was not so lucky. Rick spent a few tense hours on deck as they, fast asleep, slowly but inexorably drifted in our direction. Eventually he managed to wake them, flashing a high powered torch through their hatches and they turned their engine on with only 3m to spare. As we chatted with others the next morning nobody had had much sleep and all had there own tale of near misses to tell. Thankfully today – Wednseday – the winds have finally eased but the bay is still quite rolly. The dingy has been a feature of our stay here, it is our only means of getting from the boat to shore. Riding into the high winds, especially with all five of us onboard has been very wet, protecting the paper wrapped baguettes an impossibility. However, it is vital and tying it securely to the boat imperative but today it has “escaped” twice, we are lucky to still have it! The first time Matt dived in to get it back, the second time a passing water taxi rescued it for us, I think there needs to be some serious knotting lessons for the crew tomorrow. 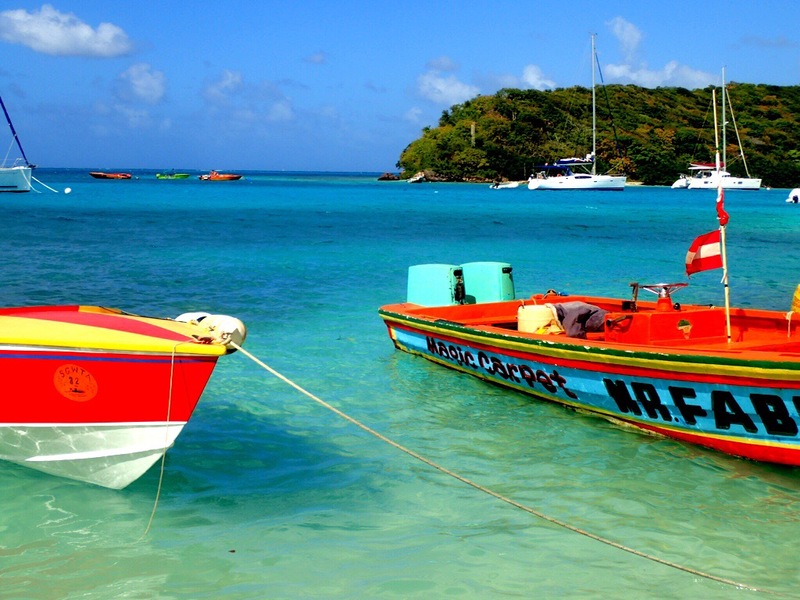 Despite the rather lively anchorage, we like Bequia it has a small town feel to it, everybody is very friendly and it lacks that feeling of intimidation we felt in St Lucia and St Vincent. As we wandered around the few streets that make up the main town, buying bits and pieces for our Christmas celebrations, there was a happy mix of boaties, tourists and locals. The interior is made up of lush, tree covered hills and the coast is rugged. Where we are in Admiralty Bay, there are two great beaches, one of which has a fun restaurant/bar, there are plenty of jetties for dingies and good snorkelling. Rachael, Matt and I swam around the small, rocky headland that devides the two beaches and saw a good variety of fish, including a small, black and white moray eel that was swimming in the open instead, as is normal, hiding amongst the crevices of the rocks and a shoal of Caribbean Reef Squid that look much like cuttle fish, rather strange creatures but fascinating to watch. Rach and Matt also went for a dive on a reef further out where they saw many more and much bigger fish. We plan to leave early in the morning tomorrow and sail to Tobago Cays, a few low islands and a horse shoe reef with stunning turquoise seas, where better to spend Christmas Day. Yesterday we left Rodney Bay and ARC World with a mixture of emotions. Excited to be getting on with the next part of the journey, sailing through the Grenadines with the Kids over Christmas, sadness at saying goodbye to our ARC family – all the friends we have met over the past couple of months and slight trepidation at emerging back out into the real world from the ARC’s protective bubble. The final night in St Lucia was prize giving night. 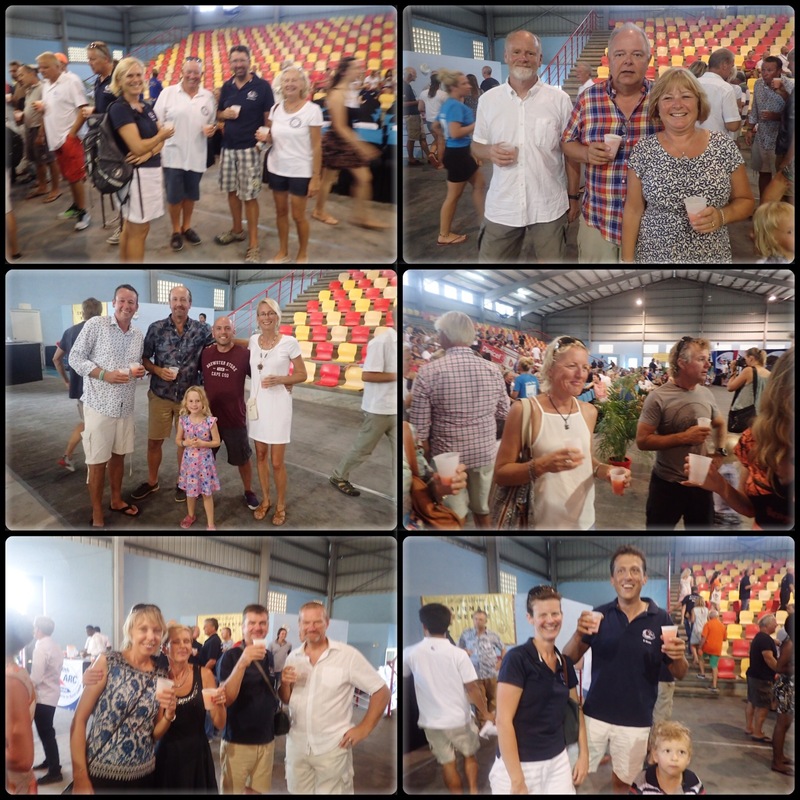 The World Cruising Club, organisers of the ARC, do a great job at including everybody in the prizes and everybody enjoyed the evening. We are still surprised at how well we did to win cruising class C and were especially pleased to win the a Oyster cup for the first placed Oyster in all the cruising classes, particularly as it was accompanied by a magnum of Moët. 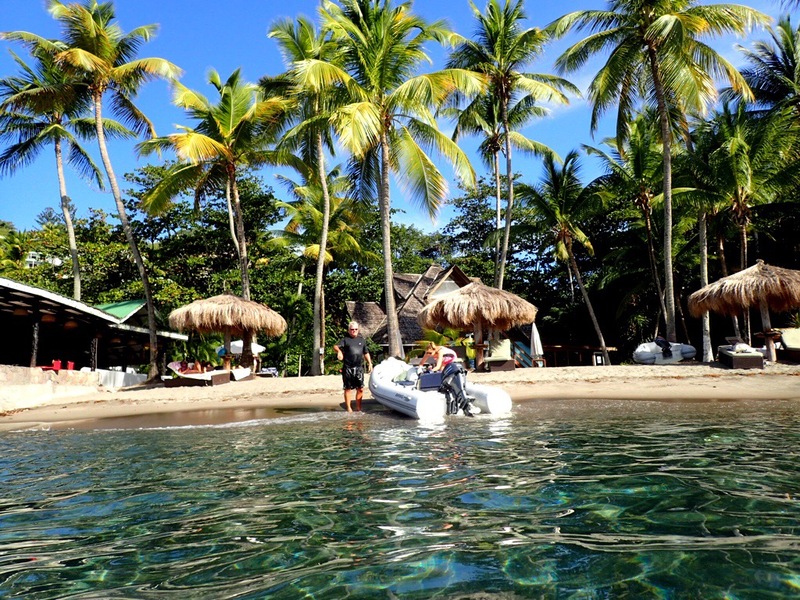 We cast off from the dock at eight thirty for the fifty four mile trip to Walilabou bay on the Island of St Vincent. It’s funny how your perspective changes, a few months ago a 54nm trip would have seemed a long way but now it seemed like a quick hop. 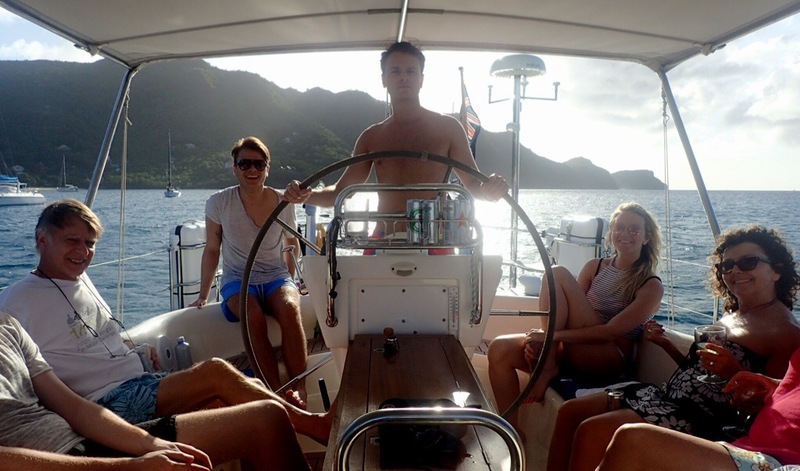 It was quite quick, we were anchored by four thirty, but it was also a rough trip, the channel between the bottom of St Lucia and the top of St Vincent was horrible – 3 metre swell on the beam, overlaid with messy waves and 40kts of wind. 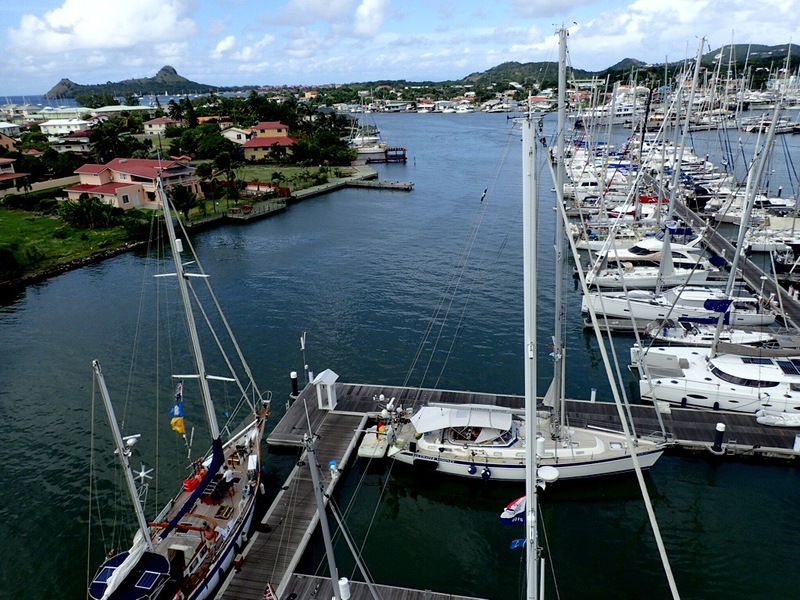 We arrived into a beautiful bay with a sigh of relief, unfortunately this was short lived, having crossed an Ocean with hardly a breakage, we arrived in St Vincent to discover the mainsail wouldn’t furl and the up button on the anchor wasn’t working. Tired from the difficult crossing this was the last thing we needed, but finally with the sail furled away by hand, the anchor set at the bows and the stern attached by rope to a tree, we dinged ashore for dinner. We would face these problems tomorrow. Walilabou bay was used for the filming of the Pirates of the Caribbean and the ramshackle restaurant was full of props, including a dozen coffins, a huge water wheel and a model of Captain Jack Sparrow clinging onto the top of a mast, as seen at the start of the first movie. The food to our tied and hungry tummies tasted excellent despite our rather alternative surroundings. We woke to a freshening breeze and we felt uneasy about the position of the boat, it sat awkwardly between the anchor and the stern line, the rocks seemed uncomfortably close. 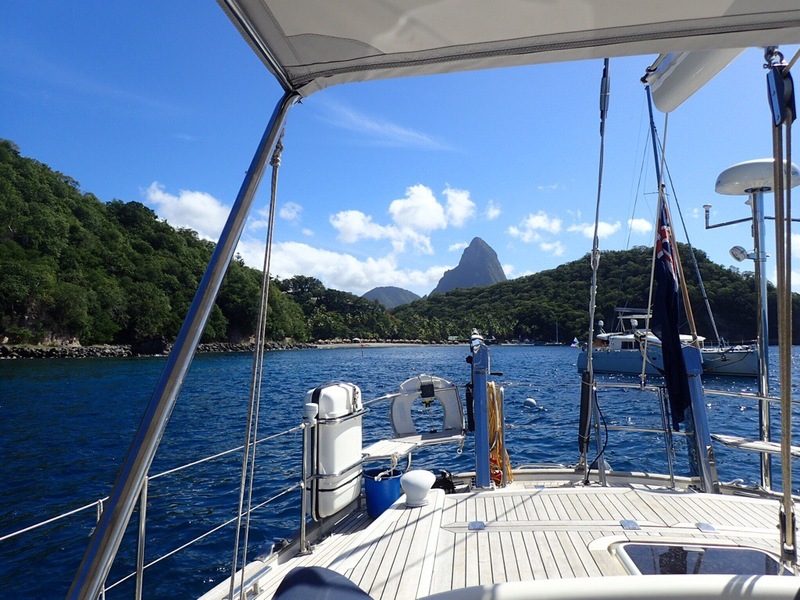 The forecast was for the winds to increase so we decided to make a break for it and sail to our next stop, Bequia, a day early. This, of course, first entailed raising 1/2 ton of anchor and anchor chain by hand, well done Rick, Matt, Rachael and Thomas the boat boy. St Vincent we’ll have to visit you properly next time around. We have left ARC World, in Rodney Bay, for a few days to take Roz B, who flew out to greet us, for a couple of days sailing. It feels great to have escaped the heat and intense activity of the Marina and fantastic to finally be swimming in the warm Carribbean sea but we sit in a place of contrast. Anse Chastanet is a beautiful bay surrounded by steep wooded cliffs that drop right down to th sea. In the foreground is a pretty resort that sits nestled in the vegetation and where we had a very nice lunch yesterday. The background is dominated by Petit Piton – the pitons are the symbol of St Lucia, volcanic conical peaks that create a very dramatic landscape. The sunlight twinkles off a green sea reflecting the trees that enclose it, we are tied to a mooring bouy with just two other boats, it should be extremely tranquil. Unfortunately our relaxation is tempered, there is a small swell that is rocking the boat just a little too much and we have been plagued by a swarm of tiny flies that has found us and our food. The real tension however comes from the boat boys that aggressively insisted on helping us pick up a mooring, demanding money for their service. They have been followed by others that continually buzz past us in a selection of rickety craft showing more interest in our boat than feels comfortable. Last week we were visited by the General Manager at Rodney Bay Marina, the day before Eric, Roz and I had dragged one of the security guards from the water, he was completely out of it, not having a clue where he was or what was happening, had we not been passing when he wandered oblivious off the end of the pontoon I’m not sure he would be with us now. I felt obliged to report the incident not just for the security of the boats he is meant to be protecting but for his own safety. So it was that the English marina head came onboard for a cup of tea and we discussed amongst other things the perception of crime on St Lucia that is damaging the tourist trade. Sitting in this lovely bay, although nothing untoward has happened, that perception is unfortunately being re-enforced. For the first few days after our arrival, life past in a daze of exhaustion and excitement. We revelled in our achievements and the congratulations of others, as all our fellow competitors, sorry participants, began to arrive and the emails and messages from home flooded in. Our smugness only increased, when wandering the dock we discovered Pixel, the boat and that had pushed us the most, was a full on, open cockpit racing boat, with eleven professional crew hot bunking and surviving on a minuscule ration of water to save weight. Bonkers! In quiet moments we reflect on the crossing, we all agreed the ‘racing’ had added to the fun, but overall that the whole experience had been more straightforward than expected. It seems we had very few breakages or problems compared to most and that most boats had used much more complicated routing than ourselves. Our success seems to be down somewhat to our ignorance, a lot to our meticulous preparation but mostly to the brilliant boat we have in Raya.